That second traditional oven will take up valuable space in your kitchen all of the time, while a circulator and plastic tub can easily go in your storage room or basement when not in use. The circulator opens up a whole new set of capabilities and creativity you’ve never had before. A huge variety of foods can be cooked to perfect, consistent doneness without losing flavor to the cooking medium. You can add marinades or brines right in the bag to enhance the flavor. Sous vide cooking can often be done well in advance, making both weeknight suppers and entertaining a snap. When you are ready to serve, a quick reheat and possibly a sear in a hot pan is all that is needed. Sous vide isn’t just for meat! Everything from asparagus to beans, potatoes to ice cream base are better than ever before. If you love eggs soft-boiled or poached, sous vide gives you incomparable control over the texture of the yolks. 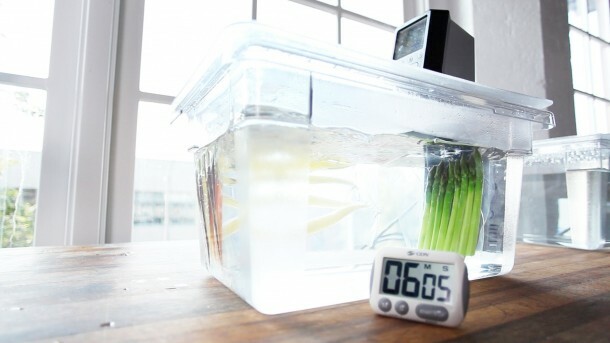 In the past, information about how to cook sous vide was difficult to come by and often geared towards restaurant chefs. The ChefSteps course makes all of the information accessible and puts it in a context that anyone can use. You might be wondering, “but what about the vacuum sealer?” True enough, professional vacuum capabilities are awesome and open up even more possibilities for creativity and food preservation. But the essence of sous vide is accurate control of heat; you can improve your cooking dramatically using an immersion circulator and a FoodSaver-type edge-sealer or even improvised packaging in a ZipLoc bag. There you have it. In my opinion, sous vide isn’t some space-age technique only for the gadget-obesessed, well-heeled cook. It is eminently practical, reasonably priced, and a perfect complement to your existing stove, oven and grill. Anyone who enjoys cooking will find it changes the whole game. So what do you think? Have I convinced you? And if not, what holds you back from getting started with sous vide? Sounds good, but I think I would have to taste something cooked Sous Vide before making that kind of purchase. Taking it for a test drive would also be helpful. That sort of price – 400 to 1100 – for what’s nothing more than a circulator and a thermometer, is the sort of price I’ll never be willing to pay. Please stop pulling our legs, and you Master Chefs, please stop concentrating only on that technique. I’m fed-up with it – altough I’ve been delighter with Nathan’s book, which goes very very far beyond your very-very short-sighted view on cooking. And please, stop sending me emails re. ChefStepsStore – or, clearly stop pretending you’re non-profit; and Nathan, please have them stop this. All this is an absolute SHAME. Jean-Luc — We’re very sorry that you’re uninterested in sous vide cooking. But I’m glad to hear that you’ve enjoyed other techniques that we covered in the book that I co-authored with Nathan. ChefSteps is offering a free course on sous vide cooking. In the future we’ll cover other techniques that interest us and our students. Perhaps this isn’t for you. I would also like to be clear that we’re not a non-profit, and have never said that we are. What we don’t do is charge people money to take part in our course or ask us questions about sous vide, or anything else related to cooking. We do sell things that we think some people will want in their kitchens, including sous vide circulators. If you would like to stop receiving emails from us, it’s very easy to click on the link at the bottom of every email from us and we promise to never bother you again. I hear comments along these lines quite often and I simply do not understand why or how this line of thinking is being applied specifically to immersion circulators. Take a hard look around your kitchen. Do you see ANY super sophisticated equipment in there? Certainly not the average oven which routine sells for much more than a good circulator. A modern refrigerator or microwave would probably be at the top of the list, but for your average kitchen, a quality immersion circulator would handily rank as the most complex and difficult to design and manufacture. Most contain a temperature controller far more sophisticated and accurate than any other appliance (and a far cry from a “thermometer”) along with a pump that can handle high temperature in a reliable, food-save manner. I’ve built a number of circulators of varying designs over the years and all required a significant ($400-$600) investment in parts alone. And as far as design goes, well, it’s scalding hot water, 120 volts, some fairly delicate electronics, and it all needs to be safe and user friendly. Good luck. It’s not a trivial task, believe me. That said, whether you think circulators are worth the investment as a cooking tool is an entirely personal matter, which I would never debate with anyone. I do, however, disagree with the notion that they are somehow “simple” devices, at least when compared to other common kitchen appliances. Just ran across this discussion which was linked to a PolyScience Facebook page, and find the criticisms of sous vide remarkably ignorant. Many of the best restaurant chefs/kitchens in the world utilize this technology to deliver consistently flawless and spectacular results. I totally agree with the premiss of “value” in sous vide. I have found that it also helps me to eat better. It is easy to make smarter food choices when I have a fridge shelf full of precooked bags of whole foods ready to brown and serve. I use a good quality rice cooker and controller. I do not feel limited by space, reliability, precision, ect. And I run the cooker most hours of any given week. My setup with photos is detailed at simplifiedsousvide website. I am also advocation skipping the vac packing and getting one feet wet with Ziplock bags if there is a motivation to save setup cost.